Building a Positive School Environment - Empower students to be responsible and caring members of our school community. 8 Ways to Build Positive School Culture Now - It takes commitment and consistency from the whole teamadministrators, teachers and support staff. But you can make it happen, even in the most challenging school environments. School Counseling: lesson plans - Many lesson plans through Pinterest. Giraffe Heroes Project - People who are willing to stick their necks out and take responsibility for solving tough problems, on the planet and on the block. School Counselor - School counselors and other educators can subscribe to a free newsletter; explore free and almost free resources, and learn from our video tutorials. 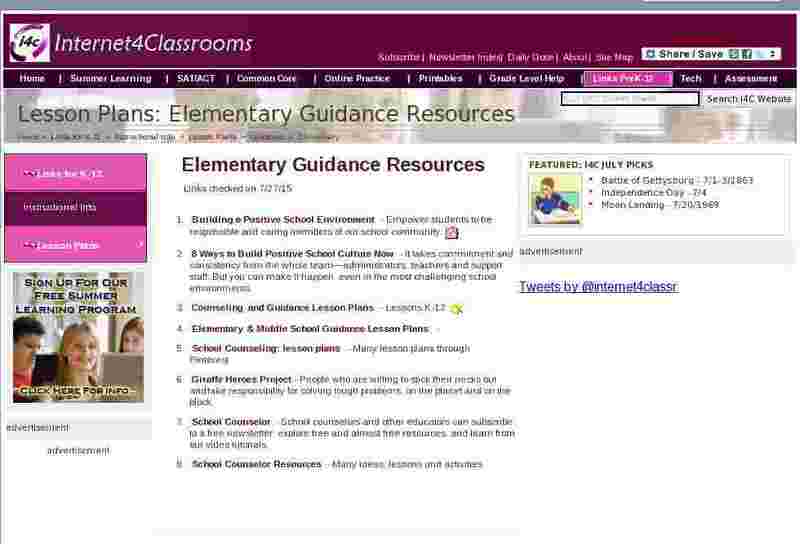 School Counselor Resources - Many ideas, lessons and activities.